Thanks to Yosemite Blog for pointing out a link to John Muir’s famous book, My First Summer in the Sierra in a free downloadable form. See the Yosemite Blog link for more information. Yosemite blog also posts about the troubling irony of a naming a Sierra highway after Muir. This winter produced a somewhat above normal snowfall, though not anything record-breaking. The season has lasted a bit longer than usual, with new snow still arriving as we approach the beginning of May. Both of these factors suggest a somewhat later opening than in the past few years. Some work on the clearing is already underway, as per the link above. However, it isn’t enough to simply plow across the pass. Various kinds of debris (fallen trees, rocks, etc.) must be dealt with, turnouts and side roads must be opened, and avalanche dangers must end. I have no inside information on this at all, but I’m going to guess that we’ll see an opening fairly close to the historical average day of May 29. I hate it when I blow it. Double-hate it when I do it so publicly. But better to own up and apologize. I earlier posted a message about what I thought was a customer service issue with my Yosemite lodging reservation. But it was my own error and my fault. It took me a while, but I finally figured out that I gave DNC the wrong confirmation number – from a previous visit – when I called. My earlier post was simply dead wrong. I am contacting DNC now to apologize for my error. I must now report clearly and unequivocally that I have had no negative experiences with DNC, their personnel, or their facilities on my many visits to Yosemite. In fact, on this occasion, when I played the part of “confused but insistent and annoying customer” to the hilt, they remained respectful and helpful and even followed up with me directly by telephone. I want to extend my apology to the reservation person, and I have so informed the DNC customer service person who called me later this afternoon. I thank her for her call to talk to me about the situation and for her calm, friendly, and helpful demeanor. I am in the process of deleting my posts on this topic along with replies based on my original mistaken post, and I have corrected or commented on those I cannot delete. The original text of this post has been replaced by what you see here, and any remaining links to it on the net should go to the text you are now reading. It is probably good to occasionally be completely and publicly wrong when you think you are completely right. Embarrassing and no fun… but perhaps good for the soul once in a while. A bit of humility is a good thing, and today I managed to re-teach myself that I sometimes need a bit more of it. Left is Right. Up is Down. In is Out. And Schwarzenegger to be honored for protecting state parks! How tremendously embarrassing for everyone concerned. Although I was in Yosemite this past weekend when the program started (yes, doing photography), between making photographs and working on them after returning I have yet to see any of the Ken Burns National Park series on PBS. However… I see now that you can you can watch them online for a limited time. 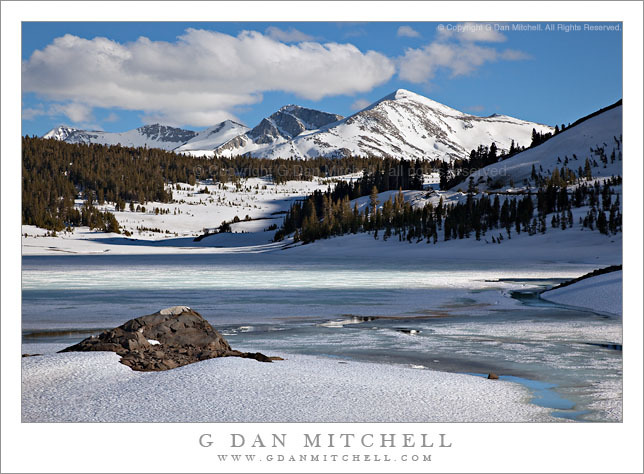 Earlier this week I spent a few days in the Ten Lakes Basin area of Yosemite National Park. Although I’ve backpacked widely in the high country of the park over the past years – OK, decades… – this was actually the very first time that I visited this popular backpacking destination. I think I had shied away from it for a couple reasons: it seems perhaps too popular and accessible, and I tend to prefer somewhat higher and more alpine terrain. But it was time, I visited, and I’m glad I did. I managed to get to the park fairly early on a Monday morning and pick up a wilderness permit without problems. (Congratulations to ranger “Elizabeth” who issued her very first Yosemite wilderness permit to me… ;-) It was less difficult to get the permit than it might be under different circumstances: school has started for many and the midweek backcountry “traffic” begins to decline near the end of August. Although I had permit in hand by 9:00 a.m. or so, for a variety of reasons I did not hit the trail until about 1:30. Although I carry a map and can do a fine job of finding my way around in the mountains with or without a trail, these days I sometimes don’t obsess over “knowing everything” (as if that were even possible!) about the route ahead of time. That was the case on this trip. I was familiar with the trailhead, having driving past it many times, and I had often looked up the valley into which it goes. But beyond that I initially had almost no idea of the actual terrain – in fact, I had long be under the mistaken impression that the Basin is on the south side of the ridge. Wrong. Before I actually hit the trail I did consult the map more carefully and discover that the lakes are actually on the other side of the ridge… and a few hundred feet below the high point of the trail on a ridge that divides Mariposa and Tuolumne counties. I was starting to catch on that there might be a bit more climbing on this trip than I had really imagined – I sort of intentionally did not measure the climb… which turned out to be about 2000 feet. Now a 2000 foot climb is not a giant one, especially compared to some of 3000′ to 5000′ that I’ve done in the southern Sierra – but neither is it exactly a happy little afternoon walk. In the end, what with stops for photography and food and water along the way, it was close to 7:00 p.m. by the time I arrived at my campsite at “lake three,” the lake to the left of the trail when it arrives in the Basin. I basically set up camp, fixed dinner, did a bit of reading, and went to sleep. Day 2 was fairly lazy. I did not get up early, so I missed some possible early morning photo opportunities, though I used the better part of the rest of the morning to scout out shooting locations for later. In the afternoon I wandered on up to the next lake and did a bit of photography, especially on the way back down when shadows from the cliff to the west were starting to create some interesting lighting conditions. I also visited the main lake (“lake two”) and found a couple scenes that I returned to photograph later in the evening. By the end of this second day I was thinking more about the tremendous panorama I had seen as I crossed the high ridge above the lake on the way in. I was stunned by the wide open views, especially toward the peaks of the Sierra crest from Dana and Gibb past Conness to other high peaks far to the north, all set off against the rock-strewn summit of the ridge, tree covered ridges below, and below all of that the depths of the Tuolumne River canyon. I started to make a plan to do a “dry camp” on the ridge on the next night and try to photograph the evening and then the following morning. On the third day I still had this plan in mind in the morning. But first I did more photography around lake three, including near the outlet stream where I had found some still-fresh vegetation and flowers. (By this time much of the summer plant life is starting to show signs of going dormant. Many flowers have blossomed and gone to seed and some very early hints of fall color are already starting to appear.) After this I decided to explore further up this creek and by a combination of use trails and cross-country scrambling I managed to get up to lake five. I returned to my camp by about 2:00 – hungry for lunch! – and soon packed up with the plan of doing that “dry camp” on the ridge for the photography. So, at about 6:00 p.m. I started down from the ridge, having resolved to make a beeline for the trailhead. Most of the trail is conducive to fast downhill walking, with the exception of a few steep and rocky sections near the beginning and end of the descent, and I made good time. I arrived at my car before 8:00 p.m. – still enough light to see well, but fading fast – and was soon on the road back to the Bay Area.